The problem with hobbies, it that they often end up taking the back seat when life gets busy. Case in point - this space and my commitment to the blog. I've totally dropped the ball over here lately, and can't quite pin it on one specific reason why. It took the holiday season to kick me back into gear. I've been busy decorating the apartment, baking all the cookies, and planning some of the best custom christmas gifts ever. This time of year I also love hosting. There's something really special about setting aside a night to just spend some quality time with friends. We realized last year that December weekends fill up quickly, so suggested a weeknight holiday soirée with friends. 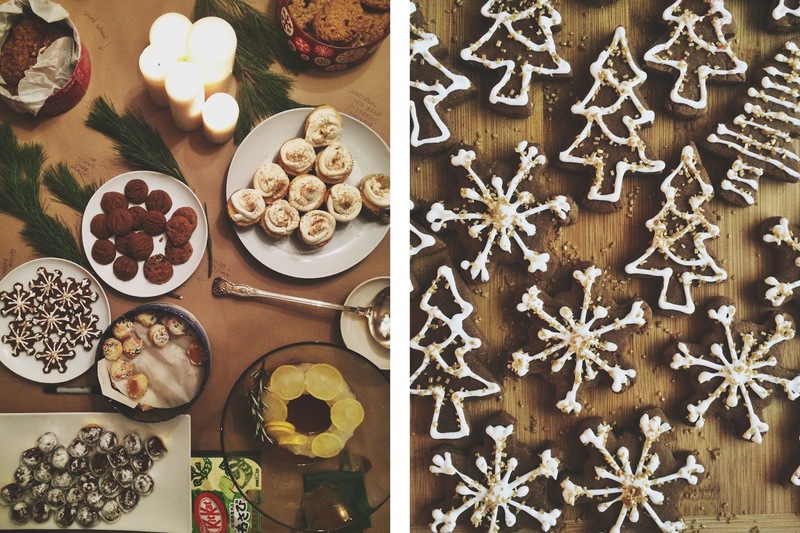 In an attempt to establish a new holiday tradition, we hosted our second annual cookies and punch party this past Tuesday -- an excuse to menu plan, decorate the house, and share in a little holiday indulgence. Weeknight hosting isn't as tough as you may think, you just need to plan ahead. I've done my best to break it down below. Wishing you all a festive and happy holiday season! 1-2 weeks before: bake 2-3 batches of cookies, and store them in the freezer. No cookies and punch party is complete without the punch! I'm no mixologist, so I turned to the trusty folks at Bon Appétit (Nov 2016 issue), for some help. I doubled the original recipe to ensure I filled my punch bowl, and had enough to feed the crowd. Half the recipe below for original quantities. The night before, prepare the tea and syrup. Steep the tea in boiling water for 5 minutes. Strain into a glass jar and store in the fridge overnight. In a small pot over medium heat, combine the honey, thyme, rosemary and water. Bring to a gentle simmer, stirring to combine. Let cool, then pluck out the herbs. Store in a glass jar in the fridge overnight. To make the ice ring, fill a bundt pan half way with water. Arrange the lemon slices in the water, trying to overlap them a bit. Transfer to freezer until ready to serve. Day of, just before serving, stir together all the punch ingredients in a large bowl. Run the bundt pan under a bit of hot water to release the ice ring. Gently place the ice ring in the punch bowl and garnish with a few sprigs of rosemary. Punch will separate as it sits, so be sure to give it a good stir before serving.